The following charts and text are an extraction from our monthly Global Recession Report, one of 3 weekly and 5 monthly reports we issue 17 times each month for an all-inclusive $395 per annum. An inspection of individual countries & trading bloc’s gives one pause for some thought. 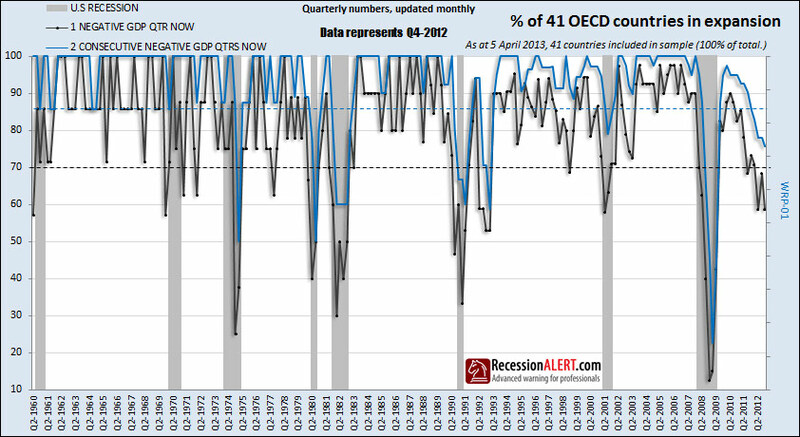 Europe (25% of world GDP) and the G7 bloc (54% of GDP) are in “mild recessions” (only 1 quarter negative growth) whilst all of the “traditional recession” (at least 2 quarters negative growth) countries are isolated to Europe and make up only 9% of world GDP. 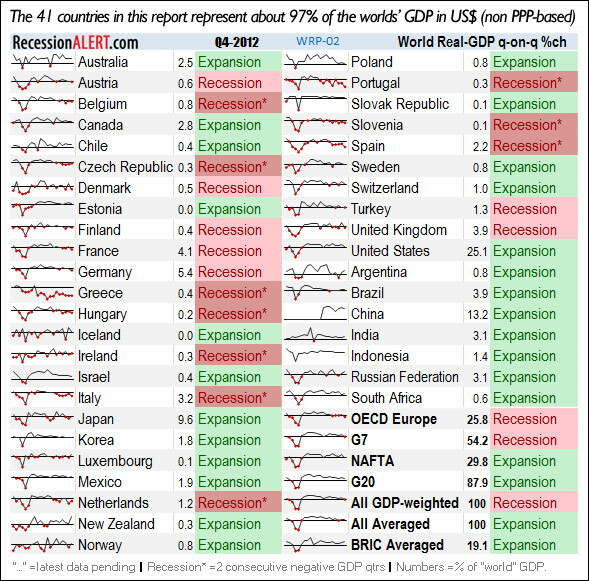 Whilst the countries that are in “Expansion” make up 74.8% of world GDP, the GDP-weighted bloc shows we have tipped into “mild recession” in Q4-2012. The “non-trivial” economies that are of concern at the moment are France (4% of world GDP) , Germany (5.4%), Italy (3.2%), Spain (2.2%), UK (3.9%) and the U.S (25%) that appears on the brink.